This video is meant as a birds-eye view of the various dances – in the future, I plan on going into more depth with each of these (as I already have with the minuet). 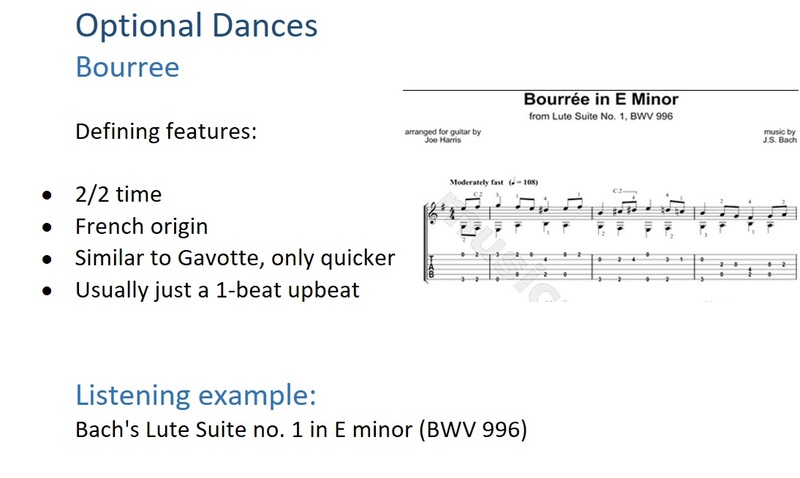 But this should give you a sense of what a dance suite is, and what to expect if you’re learning a piece from one (which you probably will, if you’re learning any Baroque music). Dance suites started in the late 1300s where musicians would pair a couple dance tunes back to back, but then it eventually expanded to include five dances by the early 16th century (Renaissance). These dance pieces are related by key and sound, so that they sound unified. For example, if one piece in a dance suite is in D minor, all of the other pieces in the suite will also be in D minor. 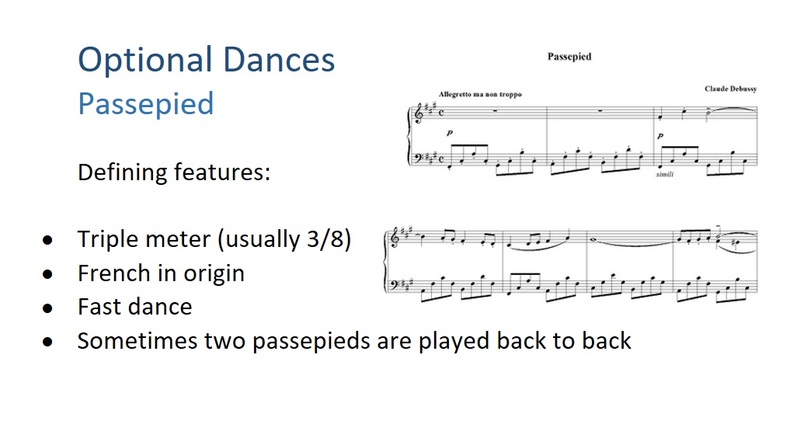 The dance suite was one of the main musical forms of the Baroque era, and are generally called suites, but some dance suites are also called partitas and overtures. It’s such a popular and important staple of the Baroque era that I figured it was time to do a video on it – any serious piano student is bound to come across music from a dance suite, even in the early years. Originally, dance suites were made for dancing, but as they evolved in the Baroque era, they were designed for listening instead, usually during important social functions. Since they evolved out of the dance floor, composers made their suites more and more complicated (and musically interesting), so that, while they still sound like the dances they’re based off, they would be impractical to dance to. The dance suite become unfashionable in the classical era where other forms took over (like the symphony and sonata). His suites, written in the 1600s, were very popular and went on to influence composers like Bach. Each of these four dances are related to a different country, so they each have their own unique style. Later in the Baroque era, composers like Telemann, Handel and Bach composed overture-suites, which is just a dance suite with an overture at the beginning (like an intro). Bach wrote a ton of different dance suites for a ton of different instruments – he wrote them for keyboard (the famous English suites, French suites and Partitas), cello, violin, flute and others. Handel was also an avid suite writer, and himself wrote 22 keyboard suites (including the famous Water Music and Music for the Royal Fireworks). By the end of the Baroque era (1750 or so), suites became old-hat and fell to the wayside in favor of the new and stylish genres of the moment, like the symphony. Suites have had a somewhat modern comeback, with Romantic and modern composers doing their modern take of them. A good example of this is Grieg’s Peer Gynt Suite (Romantic era), or Tchaikovsky’s Nutcracker ballet. Debussy wrote the famous Suite Bergamasque as an Impressionist example, and Ravel composed his Miroirs suite, both for piano. These dances, especially the allemande, courante, Sarabande and gigue, made up the core set of music in a dance suite. 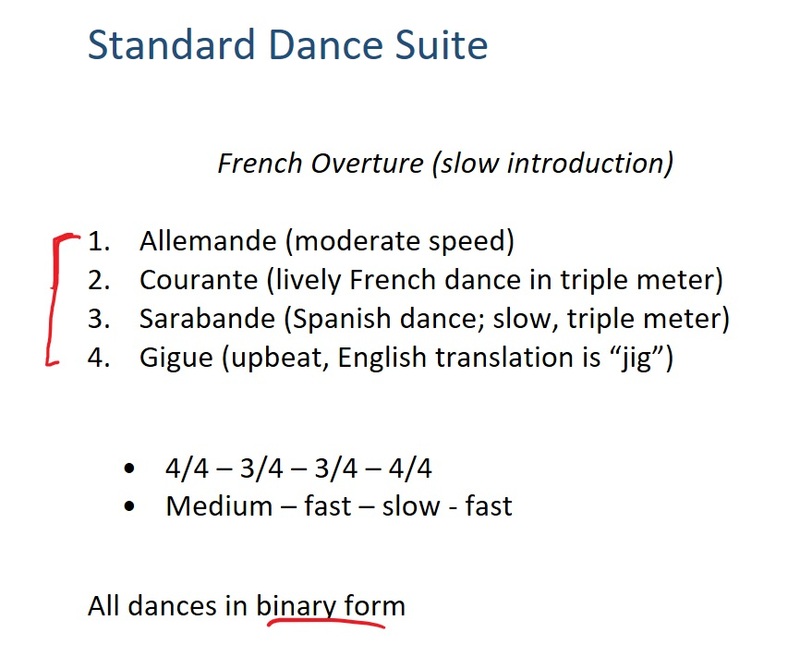 These core four dances were written in one of the simplest forms – binary form (there’s a whole video on that topic). The overture or prelude, since it’s introductory, usually has a free-form, improvisational feel to it which is a nice contrast when placed next to very structured dance pieces. The opening Overture, or French overture, was a popular way to open a dance suite in the Baroque era. 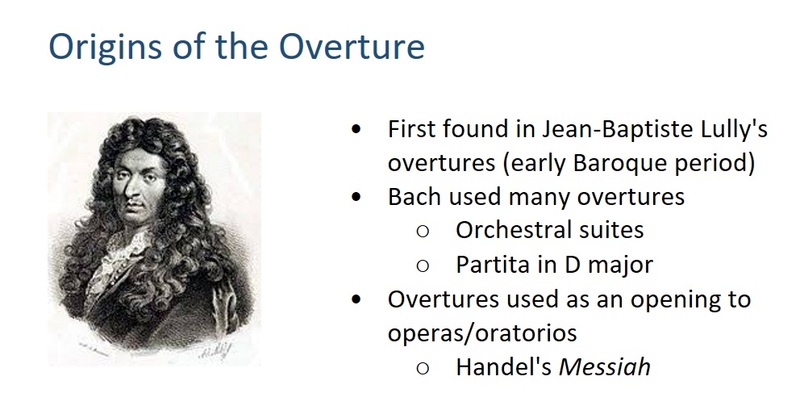 The overture was first found in Jean-Baptiste Lully’s overtures from the early Baroque era (and we’ll listen to an example of one in a moment). Other famous overtures are in some of Bach’s suites (Orchestral Suites, Partita in D major, etc). It was also used as an opening to operas and oratorios by Handel (including his very famous Messiah). Let’s take a quick peek at the overture from Lully’s “Le Bourgeois Gentilhomme” so you can hear those dotted rhythms. The German Allemande, first in the set of a standard dance suite, originated in the Renaissance era and was one of the most popular instrumental dances in the Baroque era. Let’s take a quick listen to an Allemande by Handel (HWV 429), so you can get a feel for it. Piano Solo. Composed by George Frideric Handel (1685-1759). Edited by Anthony Hicks. Piano (Harpsichord), 2-hands. Henle Music Folios. Urtext edition-paper bound. Baroque. Collection (softcover). With introductory text, performance notes and fingerings. 113 pages. G. Henle #HN336. Published by G. Henle (HL.51480336). The courante is the second dance in a Baroque dance suite, and has it’s origins in the late Renaissance in France and Italy. Courante literally means “running”, and was danced with fast, “running” steps. Let’s take a listen to a solo flute Courante by Bach, from his Partita for Solo Flute (BWV 1013). The Sarabande is the third dance in a Baroque suite, and it’s the slowest movement. Its origins are Spanish (possibly Central American) and became popular in Italy and France in the 1600s. 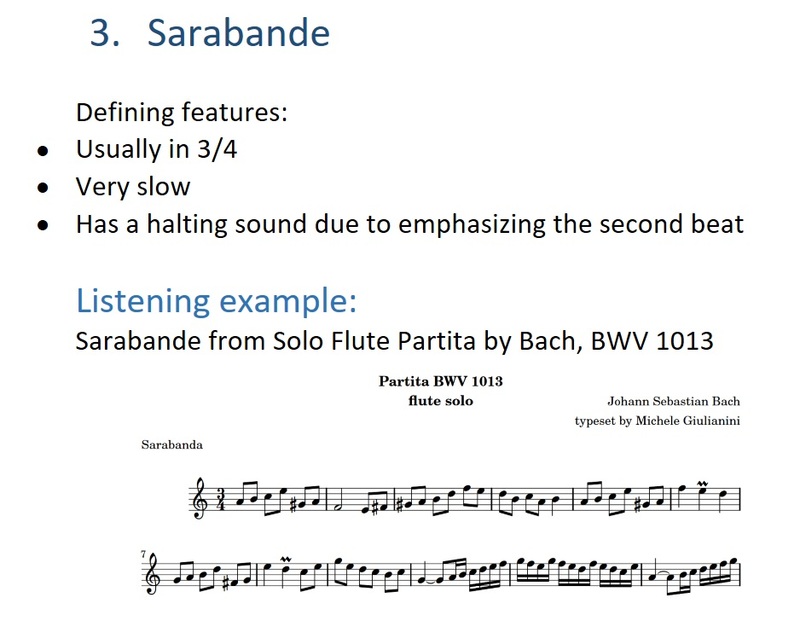 Let’s take a listen to the same solo flute Partita by Bach, this time the Sarabande. (BWV 1013). The gigue (jig) is the last movement of a typical dance suite, English in origin but imported to France in the Renaissance and Baroque eras. Let’s take a quick listen to Bach’s Gigue from Cello Suite no. 1 in G Major (BWV 1007). We’ve talked about a minuet in-depth on this channel before (something I intend to eventually do with all of these dances). 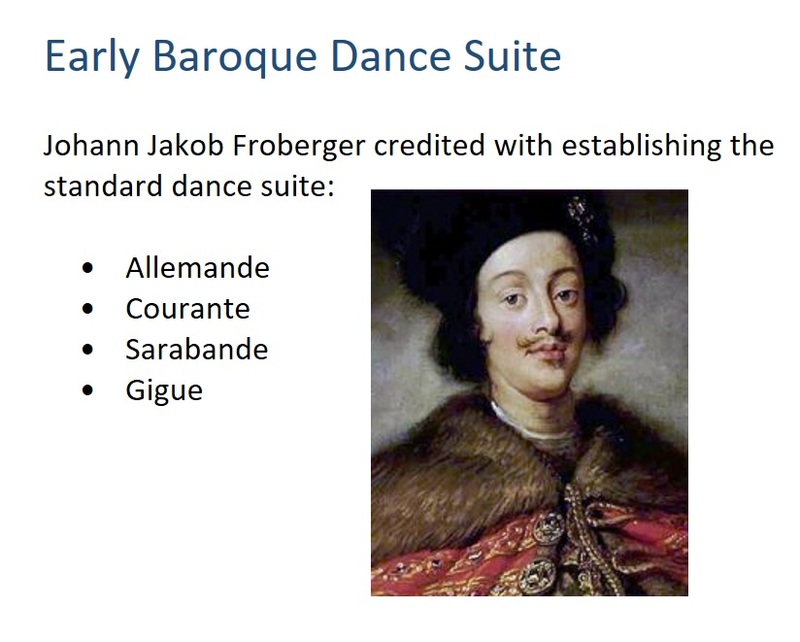 I hope you enjoyed this introduction to the Baroque dance suite! Stay tuned for the next video, where we discuss one dance suite in particular.